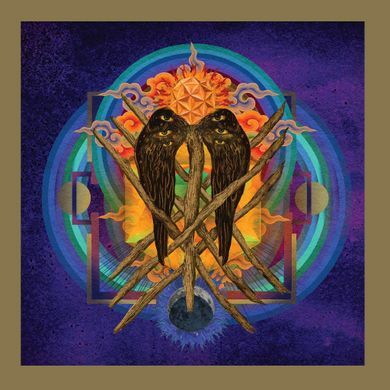 The long-awaited new album from YOB is a life-affirming gift, the violent birth born of bodily upheaval... a soul-emptying journey of unknown depths, shrouded in pouring falls of down-tuned chords, thundering bass, and pummeling drums. It's pain and joy encapsulated in vinyl. Immediately from the first chord that YOB sound is there, and by two tracks in on 'The Screen', it's fully apparent that YOB is back in full force without missing a beat. Although repetitive, it gets the point across. With 'In Reverie' we get a bass intro followed up with guitars crashing in for the kill, the doom then spreads like a slow cloud. 'Lungs Reach' is the shortest track on the album at over 5 minutes (an interlude perhaps?) of dark, dark, slow, spacial doom that builds to crushing nails. 'Beauty In Falling Leaves' is warm melodic blanket of YOB love, an epic expanse of mellow power. The percussion is...different, and dosed with reverb. It's one long zen-like timeless listen. 'Original Face' picks up the tempo with alot of strumming under tension that explodes on the pre-chorus. The title track wraps things up nicely in a 14+ minute plodding opus with soaring vocals. Topping either of the band's last 2 albums would surely be a feat, but 'Our Raw Heart' puts in a good show. The album artwork is glorious, and mind-blowing lyrics contained therein. Available in several colors at first, I ended up with the 180 gram black vinyl as the others sold out so fast. There is a download code included on the vinyl...drives me nuts where there isn't, as I don't have a record player in my car.